"I've always maintained that I've never taken performance enhancing drugs and I'll always stand by that. I'm responsible for not being aware of who I was around and their background and not researching them more." - Justin Gatlin talking with a reporter from Naples News. Gatlin's 4-year drug ban is over this year, allowing the 2004 Olympic and 2005 double World Champion to return to competition at age 27. Gatlin claims a massage therapist caused him to test positive for testosterone. What are some supplements that help runners? Percent of your HS's XC Team that ran in college? Disney Results Hansons Brooks guys Chad Johnson and Sage Canaday go 1-2 in half marathon. Mike Wardian 5th in men's marathon. One day you might beat Bekele but lose to 2 Kenyans. Multi event world champion set three personal bests in her first indoor meet. Pacquiao vs. Mayweather is unfortunately officially off, but Jerry Jones got a dream come true - the world's most interesting boxer will fight in his new, hyper expensive Dallas Stadium. The Bolt man is focusing on winning the 7 Diamond League competitions he is scheduled to run in 2010. This was an easy one to predict. Despite running on snow, recent 15km world record setter Tiru Dibaba simply bided her time and crushed very good runners over the final km to win going away by 75m. In a good show for the freezing fans, Twell and Great Britain's European Cross Champion Hayley Yelling actually controlled the pace in the first half of the race. 1st Joseph Ebuya Profile Has run 12:51 ('07); beaten by Ritzenhein, Tegenkamp and Solinsky in 2009 at 5,000m. 2nd Titus Mbishei Profile World Junior XC runner-up, World Junior 10,000 runner-up (only 19 ... this guy might be a major medalist soon). Verdict: Normally Bekele would hammer these guys, but he's not in great shape (also he said the cold weather messed him up). The IOC's decision to strip Ramzi's gold after an EPO bust in Beijing left Bahrain with no choice. Embrace the opportunities you're given. A lot happened Thursday in Abu Dhabi. We hardly even knew this race was happening but it turned out to be extremely interesting. We recap it with a bunch of the angles we heard from people today. "If they would have started just a couple of hour later, both world records could have been broken." - Italian Manager Gianni Demadonna in an IAAF recap of Zayed half-marathon. Biggest 1st-prize purse in running history? *Athletics Kenya Screws Linet Masai - Refuses To Let Her Run Lucrative Zayed At Last Minute We're not sure of details, but this might be a continuation of Athletics Kenya's decision last year to ban Sammy Kitwara from running at Worlds for chasing money at races in the US. *Get Ready For Zayed Marathon Next Year 2:05 hot weather marathoners, mark your calendars! As if the HM wasn't fun enough, UAE royalty are looking to pony up small fortunes for a marathon next year. Statistical Guru Bojidar Spiriev Dies Spiriev made numerous contributions to international track and field, including the scoring tables used by the IAAF to compare performances across events. This piece is almost as long as a Bill Simmons column. LRC Linet Masai - Why Did Athletics Kenya Prohibit Their Star From Running Million Dollar Race? We use past experience, if not hard facts, to answer the question. Linet Masai, the Kenyan Sportswoman of the Year for 2009, was prohibited at the last minute from running Thursday's Zayed Half Marathon and winning at least $100,000 prize money. *Earlier: Justin Gatlin Ban Coming To An End - Big Words Fly As He Says He Can Beat Bolt And Gay Gatlin has been banned for 4 years. Bekele talks in this piece about his place in the sport and the respect he gets (or doesn't get). He has 24 Olympic and World Championships and has never been defeated at 10,000m. *Edinburgh Intl XC Preview Dibaba vs. Cheruiyot on women's side (plus Britain's Steph Twell and Hayley Yelling). Kenyan Runs First Half Of Tiberias Marathon In 61:42 (Israeli HM All-Comers Record) Before Fading To 2:18! This recap of the Tiberias Marathon, run in almost 80° weather, will shock you. Kara Goucher raised her profile big-time in 2009 with her moves up to the marathon and half marathon. LRC What Was The LRC Quote Of The Year In 2009? Final tallies happening in 48 hours ... It's the most effective and interesting way to review the year in running. We're letting our loyal site visitors determine the quote of the year for 2009. No need to log in. All you have to do is pick your favorite quote of the day from the ones we give you for each month. 2009 LRC US Rankings All The Rankings In One Place While you were on vacation, you might have missed an LRC first - the end-of-the-year rankings for US runners in events from 800-marathon. 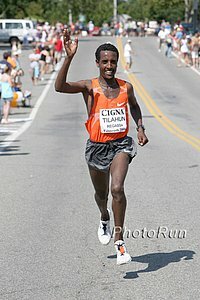 2009 was a banner year for US distance runners and for LetsRun.com and we thought of no better way to celebrate the end of the year than with the first-ever LetsRun.com US year-end distance rankings. We give you the top 10 in each distance event.